When the seventies come a-callin', you better pick up. Lush lace crop top (similar here), Nasty Gal What the Bell bottoms, Quay Eyewear Kitti sunglasses, Fringe bucket bag c/o Petit Sesame, Jennifer Fisher small gypsy finger ring, Mossimo braided belt, Forever 21 platforms. Shot by Isaac Lacey. Super excited to finally present you guys with my new hair color on the blog! Or, should I say, old hair color, as it's pretty much fully faded back to my normal ombre over the course of the past week thanks to endless swimming & sunning in California over the weekend. It was fun while it lasted, though! The dye was done last week courtesy of my talented roommate and hair genius Shane Thomas. I'd been bored with my locks and contemplating a little change-up, and in the end was inspired to go aqua by this pic I found online. My biggest fear was that the color would wind up too green, but Shane mixed up the perfect combo of turquoise & forest green... et voila! Such a fun, funky summer hue. I love looking at these snaps: it's almost like looking through a mirror at a totally different me. So what do you think of the look? Would you ever go green? Lovely! And your hair are looking amazing! 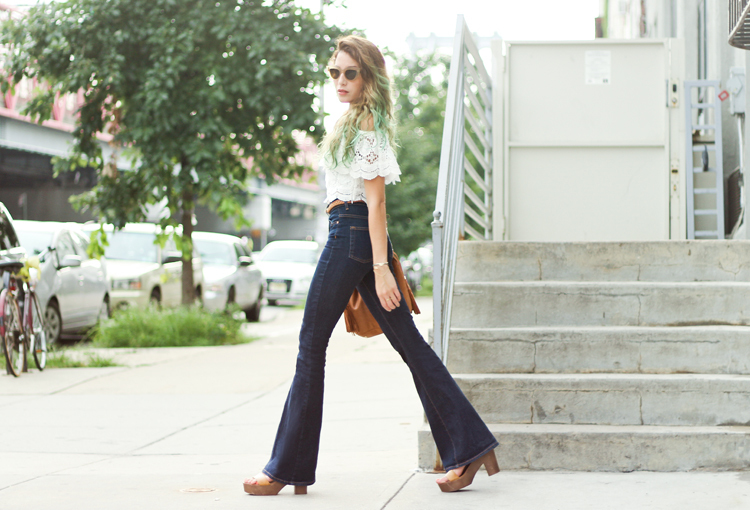 Love this look with the flare jeans and yout hair is so cool! Cool hair, love your top. Great color and love that lace top! That color looks so good on you! I don't think green is something I would have the guts to try personally, I'm not too big on bright colors bc it makes getting dressed a little tougher. I have been considering dying my hair a dark purple/grey, so that way when my roots grow out, it'll be ombre. I love love love the 70s vibe in your outfit! Those flare jeans make your legs look miles long, and I wish I had your shoulders!